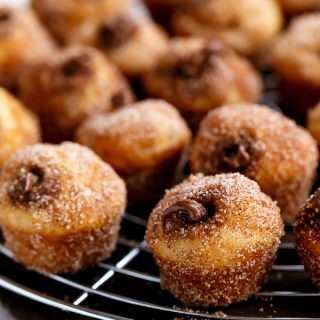 Made with an easy batter, baked until golden, brushed with melted butter, rolled in cinnamon sugar and stuffed with Nutella. It’s hard to believe each donut is only 64 calories. Your new edible obsession is oven-baked, not fried and made with light ingredients, creating the perfect breakfast snack or dessert full of flavour without the fat. The perfect little snack or something sweet to enjoy with a cup of tea or coffee. All done in a mini muffin pan before being stuffed with Nutella, there may be some frantic finger licking between stuffing. These little Churro babies are worth everything and more. Made with a handful of ingredients and take no more than 15 minutes to prep and bake and maybe another 2 minutes to coat. Add on another 2 minutes to fill…depending on how much finger licking and Churro stealing happens between fills… no one has to ever know. 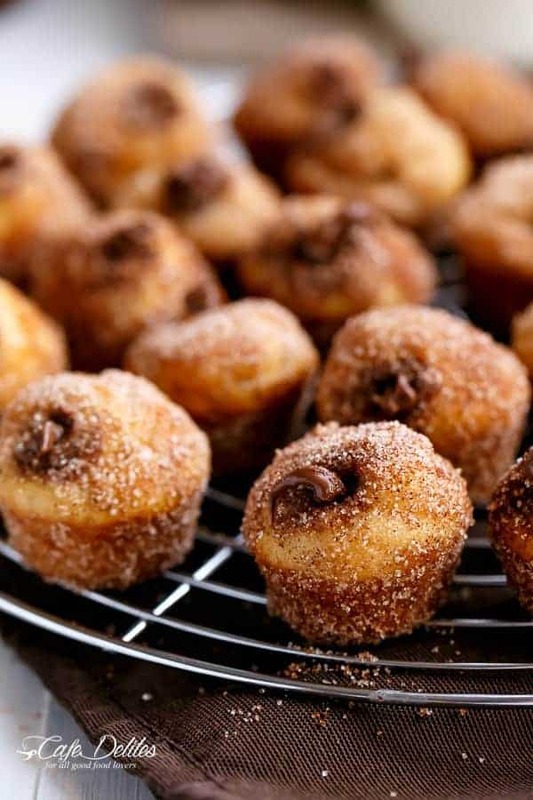 Fill all the Donut Hole cravings with this Baked Donuts recipe! Love Churros? Try these recipes! 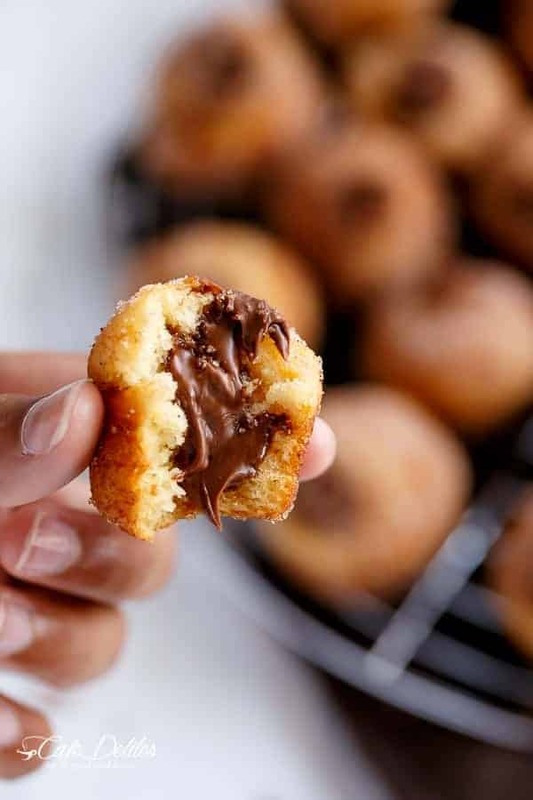 Watch how we make Nutella Churro Donut Holes right here! 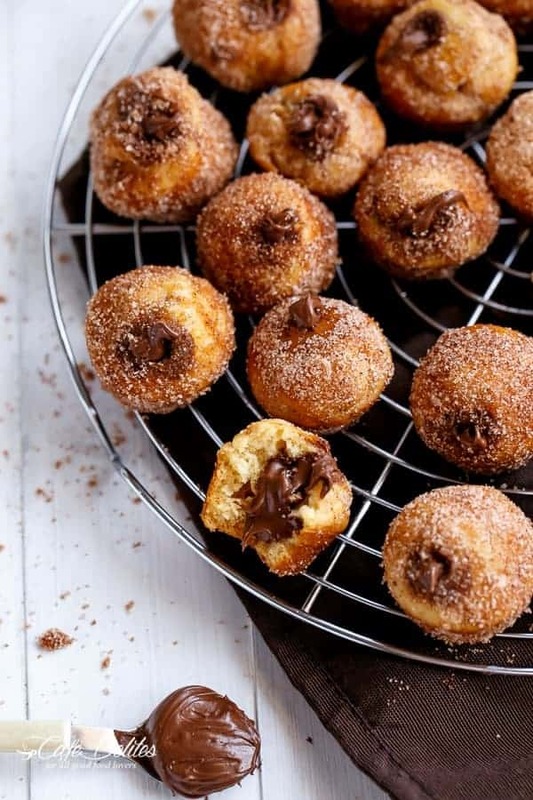 Churro Donut holes, oven baked and filled with Nutella! Coated in a buttery Cinnamon Sugar gives you the Churro fix without needing to go anywhere. Preheat oven to 350°F (175°C). Spray a 24-count mini muffin tray with cooking oil spray; wipe over excess with paper towel and set aside. In a large bowl, whisk all of the dry ingredients together. Make a well in the centre and add the oil, egg, vanilla and milk. Whisk the batter until smooth and lump free. Spoon the batter (about 2 teaspoons) into each muffin hole, filling to to 3/4 full. Bake for 10-15 minutes, or until they are golden in colour and a toothpick inserted into the centre of a donut comes out clean. Allow them to cool for 5 minutes and transfer them onto a cooling rack. 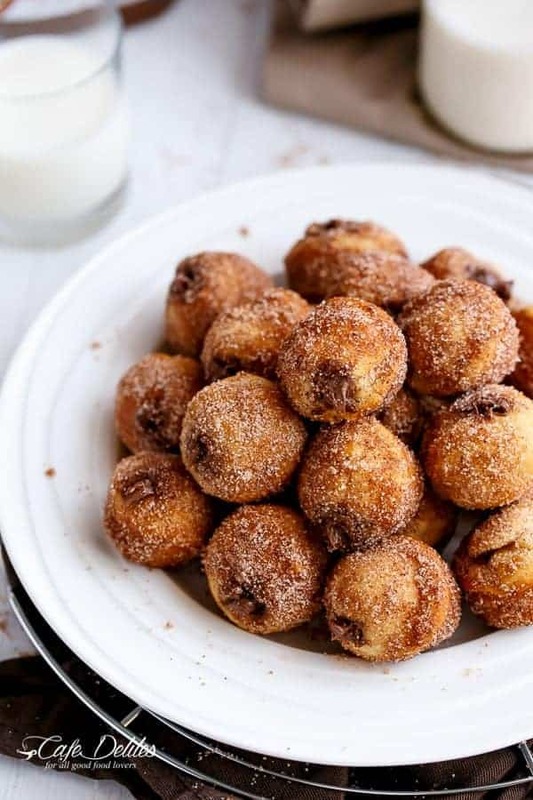 Brush each donut over with a light coating of melted butter; combine the sugar and cinnamon together in a shallow bowl; toss each donut hole into the cinnamon sugar mix until evenly coated. Fill a piping bag with the Nutella. Using a a narrow nozzle, fill each donut with the Nutella until they puff up and expand (not too much or the donuts will overflow). This looks and sounds delicious! I am so excited to try this recipe! What is the best way to melt the Nutella? can these be made without Nutella. Would they still be good? I love Churros and these look so easy to make. Hi, i hope this is a stupid question. Im in Australia and we use a fan forced oven do you know what the temperature should be for these? Planning to try this out this weekend. Just wondering, do you put nutella fillings after the batter is baked or before? Thanks!! I have never baked anything in my life and gave this recipe a shot last week. I baked it for my husband and he loved it was very impressed hehe heh thank you for your recipes and getting me inspired to bake!! Ps I don’t know if you like to mention in your recipes that you use an electric oven because mine is gas so things do cook up faster. These are AMAZING!!! I love how light and fluffy they are. So much nicer than the fried donuts you buy at cafes! Hey, I dont have a small muffin tray so I was thinking I could just make big versions in a 8 muffin tray and just increase the cooking time. Do you have any other ideas? thanks! Was wondering if your batter was a bit sticky and thick not to thick ? Did I miss something ? Hi Nicole. The batter should be thick. Did they turn out for you? Just made them.. delicious!! Im not a big baker but this recipe called my name and I had to give it a go. Miraculous they came out great! I dont have a piping back but I have a two year old snd hence lots of Panadol syringes in the house and crazily enough it worked great. 1 1/2 5 ml syringes per donut;p Thank you!! With plain/all purpose you need the 1 teaspoon bp + 1/2 teaspoon bs option! I hope they like them! Hi!! These look incredible but I was wondering, does it tastes the same if you eat them a day or two after as it does the day you make it? Or is it a type of food you should eat only the day you make it? My daughter cant have gluten so can I use gluten free flour ? And then do i still need to use baking soda ? Sounds like a great recipe! I was wondering would there be a difference if I used regular all purpose flour instead of rising? Also instead of using a piping bag because I don’t have one, could I just put the nutella in between the batter before it goes in the oven? Thanks. These look amazing I am going to have to try and make them soon. I shared this on my facebook news feed as well hopefully some of my friends will be able to enjoy your great photos and creations as much as I do. XOXO keep up the great work. Wow Michael than you so much! I’m so happy you like them! You have done it again my dear 🙂 These are gorgeous! Must try them out! Pinned! Hi! I’m not too sure unfortunately as I haven’t tried any other flour with these? What type of substitution do you normally use? Oh, wow, they look incredible again! I love the swirl of the nutella in the top photo, so beautiful! Wow thank you so much Nicole! I have such a hard time narrowing down my shots..but I’ll get there eventually. Your feedback means so much to me!